Jupiter in 12th house till mid July and then in 1st house, Rahu in 2nd house, Ketu in 8th house and Saturn in 4th house throughout the year, together determine the major transit results this year. In 2015 chart, Lord of your sign, Sun is again well placed in your 5th house which is the pursuit of Vocation or Dharma result house. The main theme of this year will be that wherever or in whatever activities you will concentrate, you will be successful. Your rewards will totally commensurate with the efforts that you will put in that specific activity. The greatest success you will achieve during this year will be in areas of collaboration and partnership both in your personal front as well as in your professional front. There will be overall consolidation in your financial front and family prosperity. New ideas would come in. Maturity in thinking would come back and you will also be happy with regards to children during this time. Overall July onwards you will feel much more in control than at the beginning of the year. Despite the progress the year will see steady rise in domestic hassles and issues with regards to day to day working of the house. There could be reasons for distance from home, discomfort due to travel without gaps and all these things could also make your temperament irritated and negative at times. Health of father could be difficult and even issues relating to mother could come up after March 2015. You have to be careful and be prepared for any sudden emergencies. There will be family issues mostly on account of political pressures and negative thinking. Sub conscious could be burdened due to a lot of issues over work and that could have a negative impact on the relationship with people around you. Expenses could be wasteful and you might incur overheads which are unnecessary. Despite all these things another source of income could build up. You have to be cautious against any tax or legal issues as these matters could also come up and bother you at times. Health could be below average and you might struggle a bit on account of vitality and energy. The bright spark of the year could be a sudden love relationship opportunity after 26th July 2014. There could be a sudden rush of opportunity in love matters till the 14th August 2015. Have a nice time since its going to be a very bright and sparkling period, beyond the 14th August 2015, the promise of the period might go down but still it’s a good period to have a nice time and indulge yourself. Physical desires would be high and you should be cautious not to make any mistakes in terms of enthusiasm while pursuing your desires. Wait to cross the 6th September 2015 before you take any major decisions in love or relationship matters. Finances could be a bit unsteady around end of January, early February, May and September 2015. Avoid major commitments during this time. January, May, June and October could be better months compared to the rest of the year. Your general counsel and ability to make good decisions might be a bit compromised as the year begins and so you should try to take good counsel from people whom you trust during this year. Family and domestic matters could pull you down and you should have plans or process of having a backup in place. Since you might be needed in more than one place at various times during this year, avoid depending too much on a single person and ensure that you have your team in place for various things around you. Diplomacy in thinking is required as well as in speech but do not put off others by being deceptive in speech as that could make a very negative impact overall for you. Health : Health will be excellent during this year. Even if there are minor ailments like cold cough, fever etc, Mars is exalted in your 6th house during this year and you will be able to recover easily. The main thing about your health is your own self confidence about your own ability which might have dented because of certain setbacks during 2014, which will be completely restored during this year. Finance : 4th and 9th house lord, Mars is exalted in your 6th house. Jupiter is exalted in your 12th house. There are strong possibilities that you may acquire some real estate in terms of land and property. You may also recover some old debts and some of your investments may mature during this year. The most favourable period will be September /October for financial gain or financial recovery. Education : The year is favourable for those students who want to go to foreign countries for studying. Also, they will get success in competitive examinations. In the latter half of the year, Jupiter�s transit from the 12th house indicates success only after hard work. You need to be confident as it will bring success. You might take wrong decisions in haste, so take time while deciding anything. Career : Whatever efforts/initiatives that you will take during this year will be successful as per your expectation. March and August will be the most successful month during this year. Even if there are unexpected setbacks during these months, your destiny and luck factor will be very favourable for you and no harm will come to you. Family : It is not a good year for family matters. You will be surrounded by mental and family troubles due to Saturn�s dhaiya. Family responsibilities will increase as a result of which you will experience mental pressure always. This is the reason that you will feel the absence of family happiness. You will not get the support of family members. Hence, develop the qualities of tolerance and self-dependency in you. After July, all your troubles will decrease. Travel : A favourable year for travel. There are strong chances of foreign trips during the latter half of the year. People with religious nature will enjoy trips to holy places. People in service should not go for a transfer during the latter half of the year as they will not get the desired place of posting. Romance & Married life : Entire 2015 especially after May/June is most favourable for Leo people to find a life partner during this year. This is the strongest aspect of your horoscope during this year. 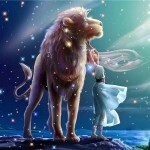 However this year may not be very favourable for day to day married life because Saturn aspects the 7th house of Leo. There may be ups and downs in day to day marital life.